So, Friday afternoon rolled around with Baby Lady asking me what I was going to do with the tuna. I had been pretty occupied on some legal matters I was working on so I hadn’t thought about it. I told her I hadn’t thought about it so she started providing me suggestions. Poke?? Baby Lady loves poke. I told her no because the last several times we purchased tuna we made poke and I wanted something different. Sushi?? No, I explained, I wasn’t in the mood for sushi. Ceviche?? Again, no, that’s not what I want to do. So, we finally make it back full circle to the original question, Well, what ARE you going to do with the tuna?? At that point it became necessary to think about the tuna. What was I going to do with the tuna? 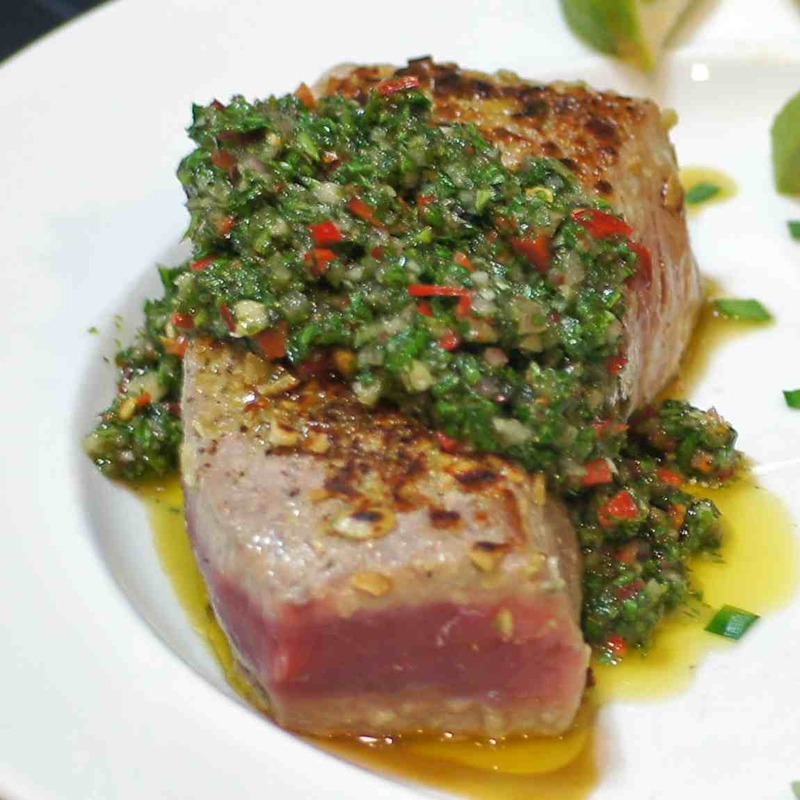 After thinking about for a while I decided chimichurri would be a wonderful accompaniment for the tuna. 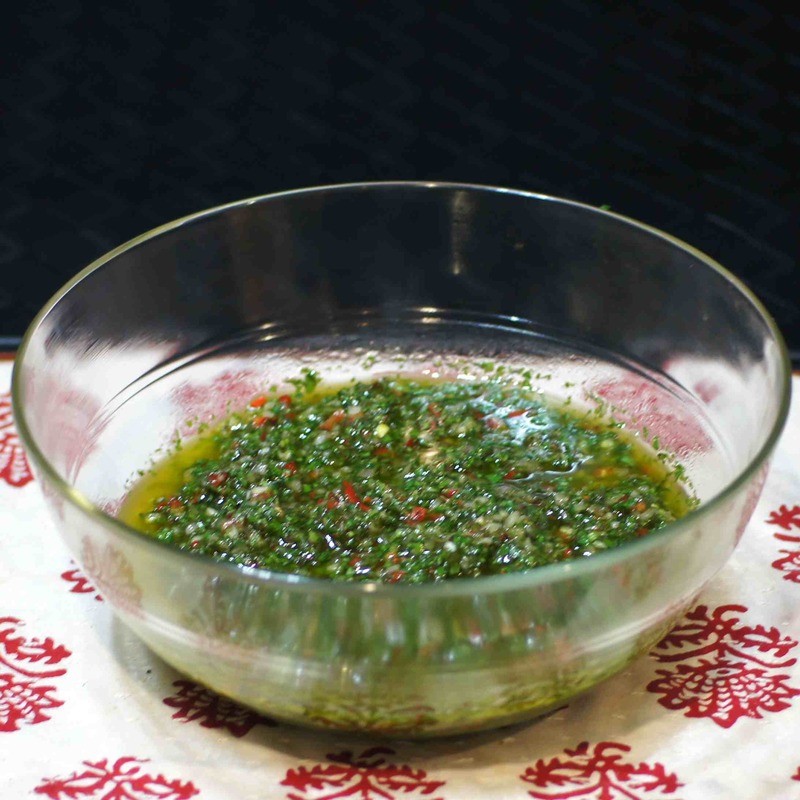 Now, for those of you unfamiliar with chimichurri, it is an Argentinean sauce traditionally served with grilled meats, typically steak. 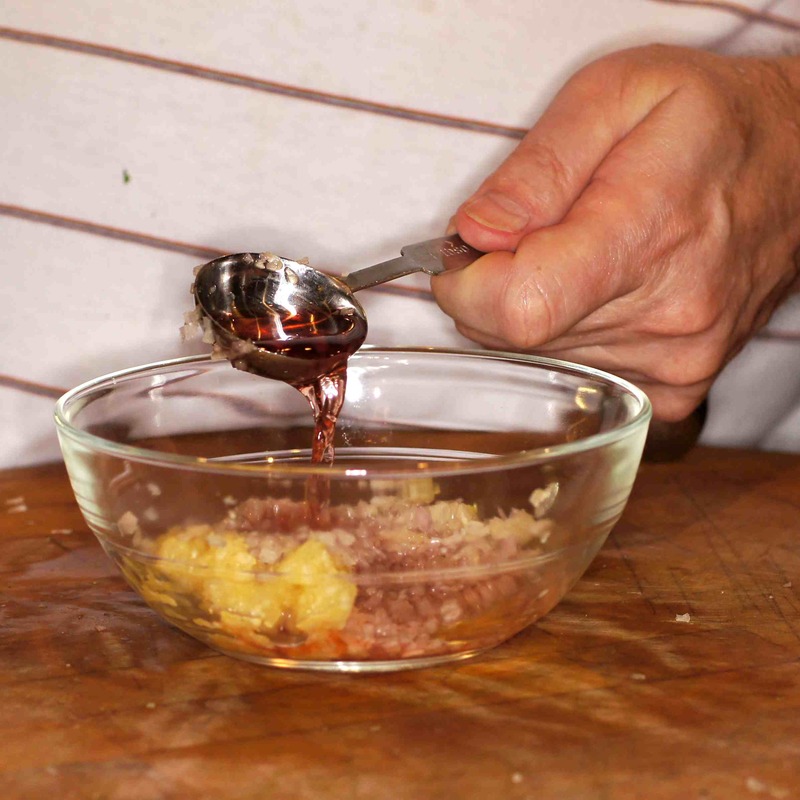 It is an essential condiment in Argentinean cuisine and is found on every table in Argentinean households. 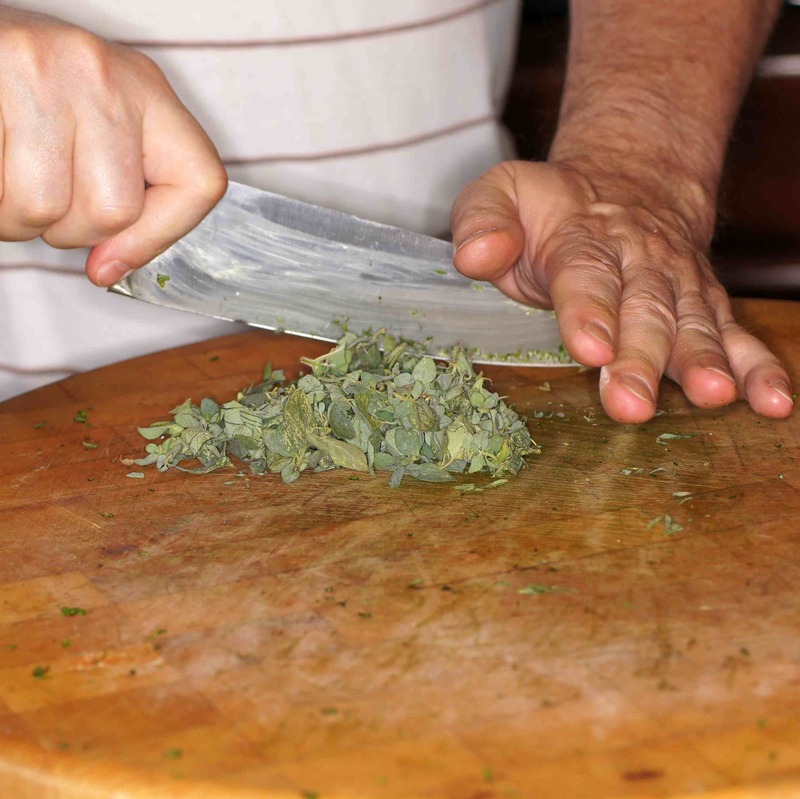 It is akin to a French pistou (pesto without the nuts and cheese) but is made with parsley instead of basil. It has a flavorful herbaceous bite that pairs well with the smokiness of grilled foods whether they be beef, pork, chicken, game or even seafood. 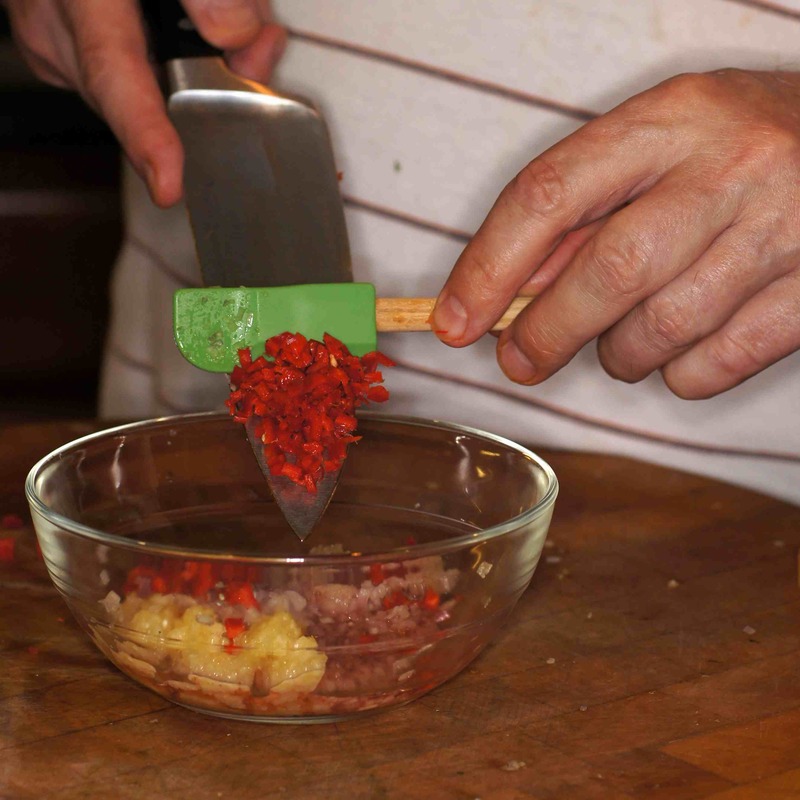 It also cuts through the richness of fried foods, and can add some zesty flavor to a mild dish. It’s really quite versatile and very tasty. 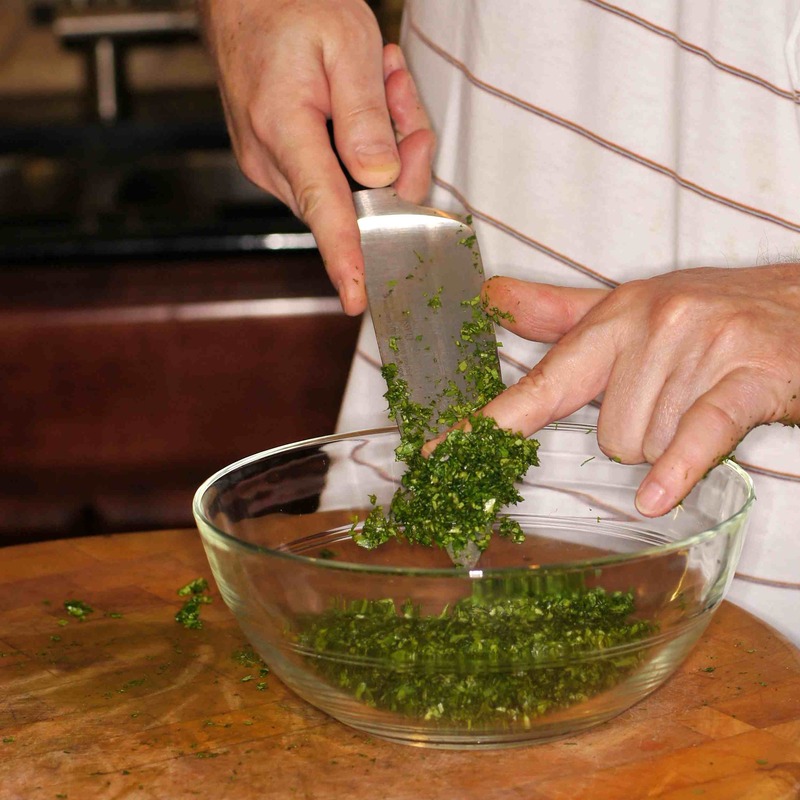 Traditionally, the essential ingredients of a chimichurri recipe were parsley, olive oil, garlic, onion, salt and pepper. 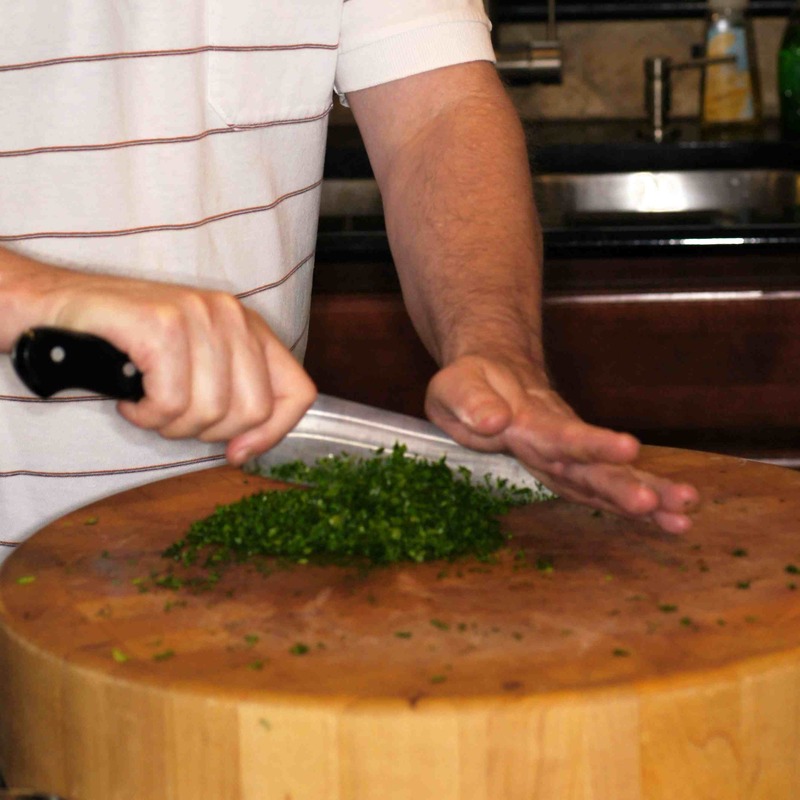 Because of its immense popularity everybody began doing their own spin on it to match their own tastes and go with whatever dish they were making. 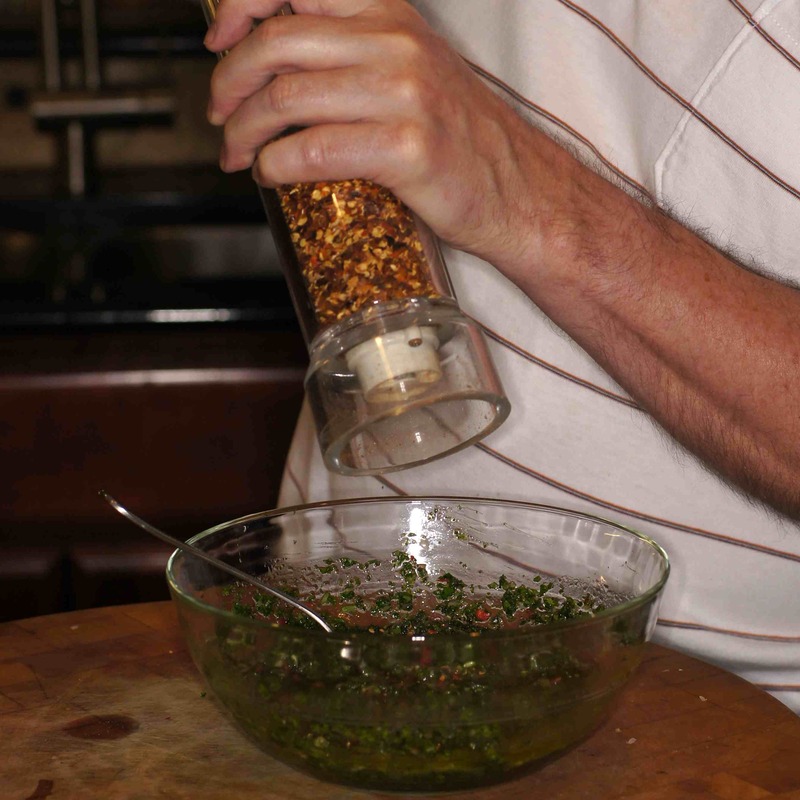 Nowadays, you find chimichurri sauces with the addition of various elements including, but not limited to, vinegar/citrus juice, cilantro (in addition to the parsley or in lieu thereof), red chile flakes, paprika, fresh or dried oregano, fresh hot chiles, coriander, paprika, cumin, thyme, and even bay leaf. 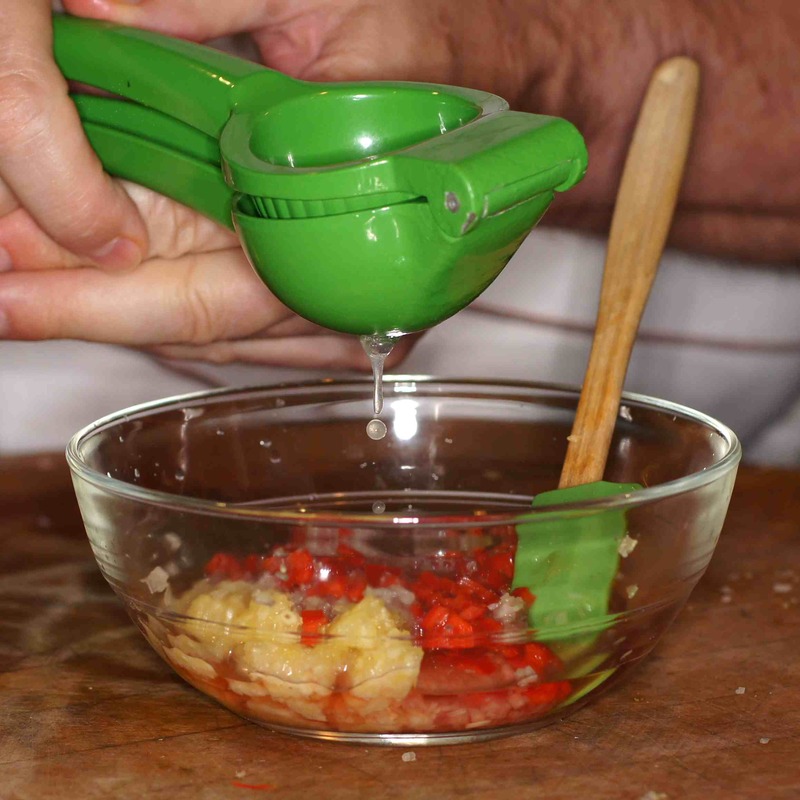 It also has a red version with tomatoes and red bell peppers. 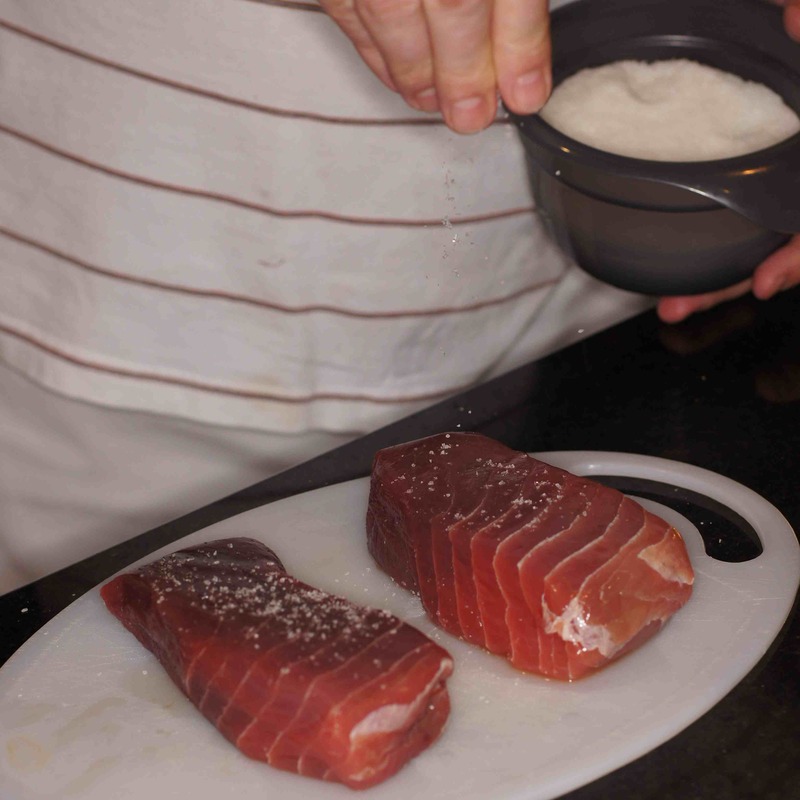 Now that I had decided what I was going to do with the tuna, the next question became how to prepare it. 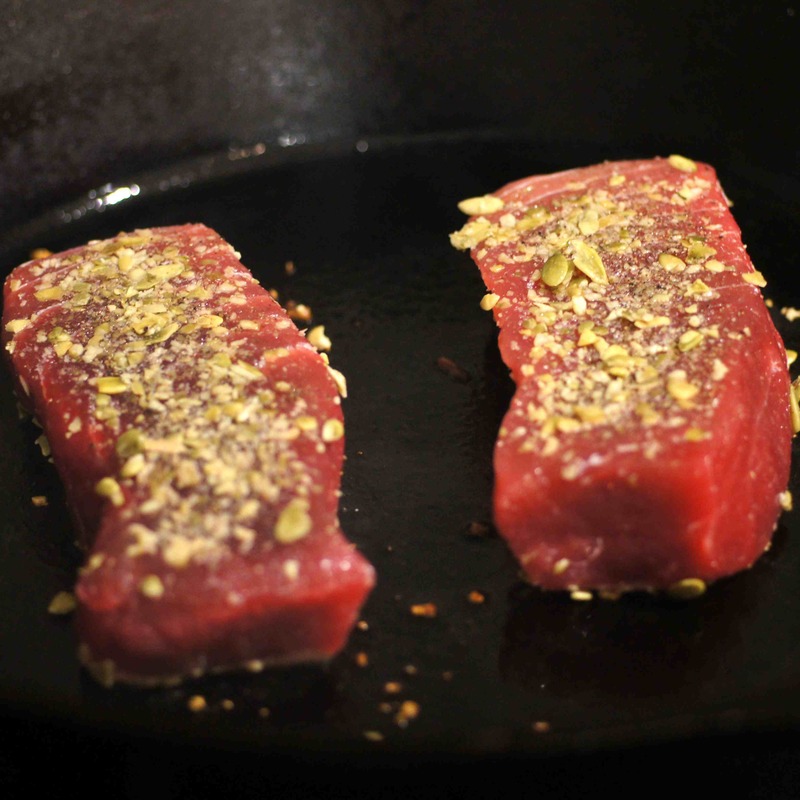 I already knew I wanted to sear it because it was very fresh having been flown in from Hawaii the day before. 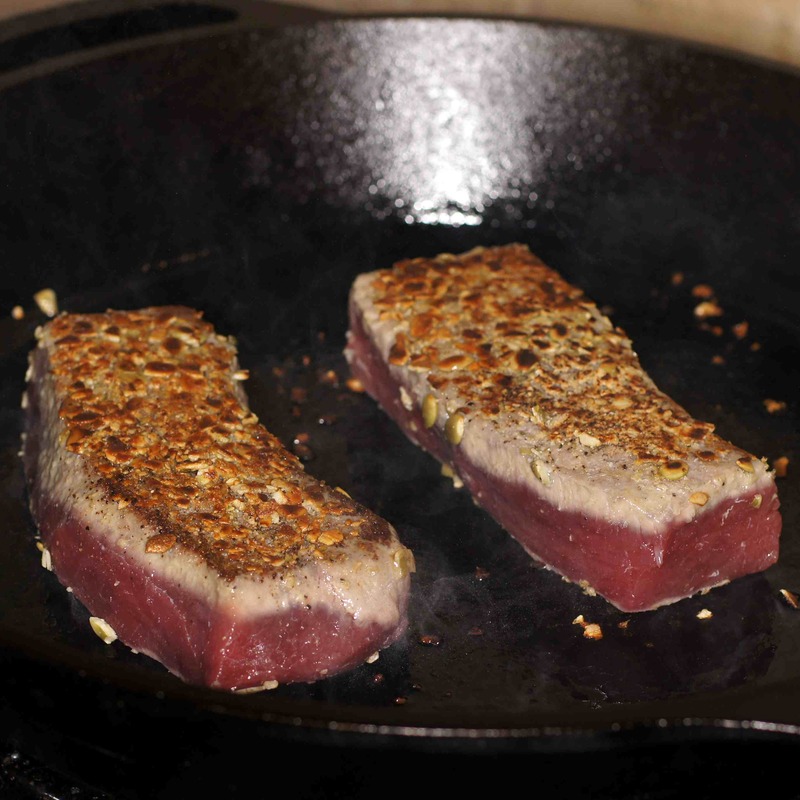 Simply searing the tuna seemed rather drab even with the chimichurri and I wanted some textural element, as well. 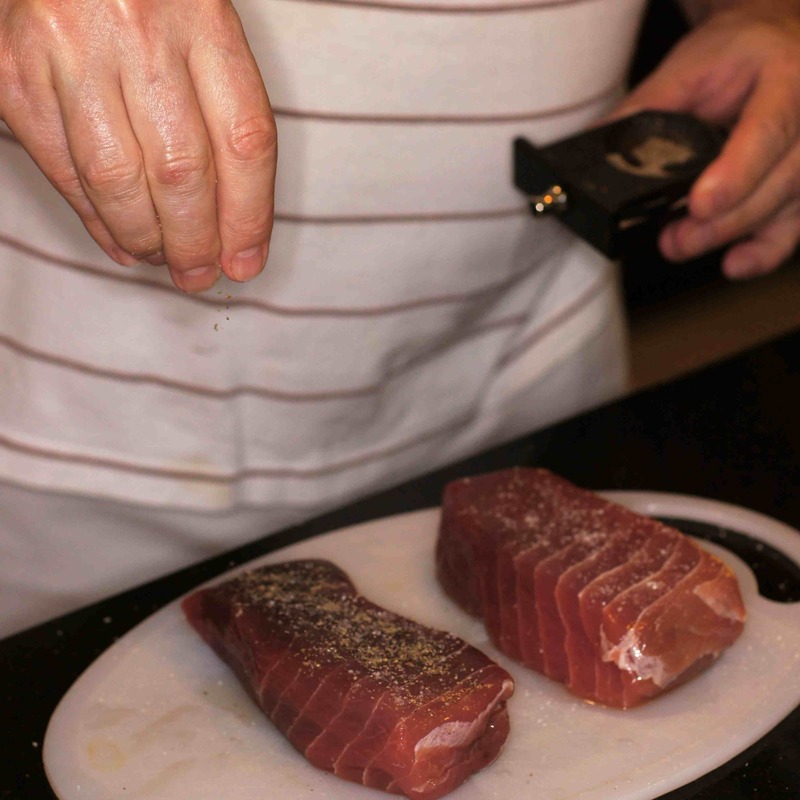 Given this was an Argentinean-south of the border inspired tuna I thought pepitas would be a great crust for the tuna. 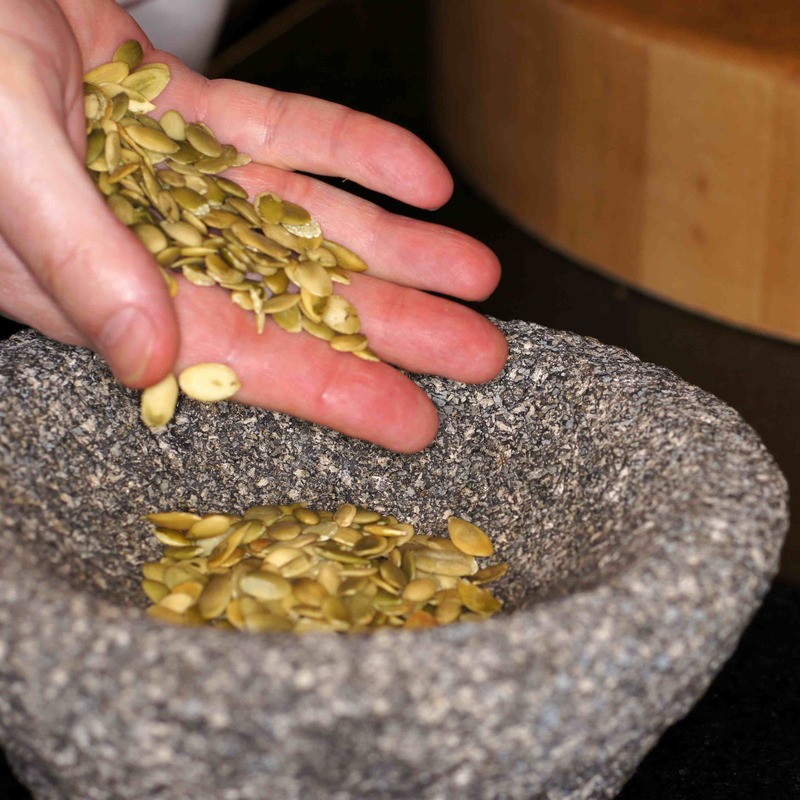 For those of you unfamiliar with pepitas, they are pumpkin seeds. They add a nice, nutty, earthiness to a dish and toast up very nicely. 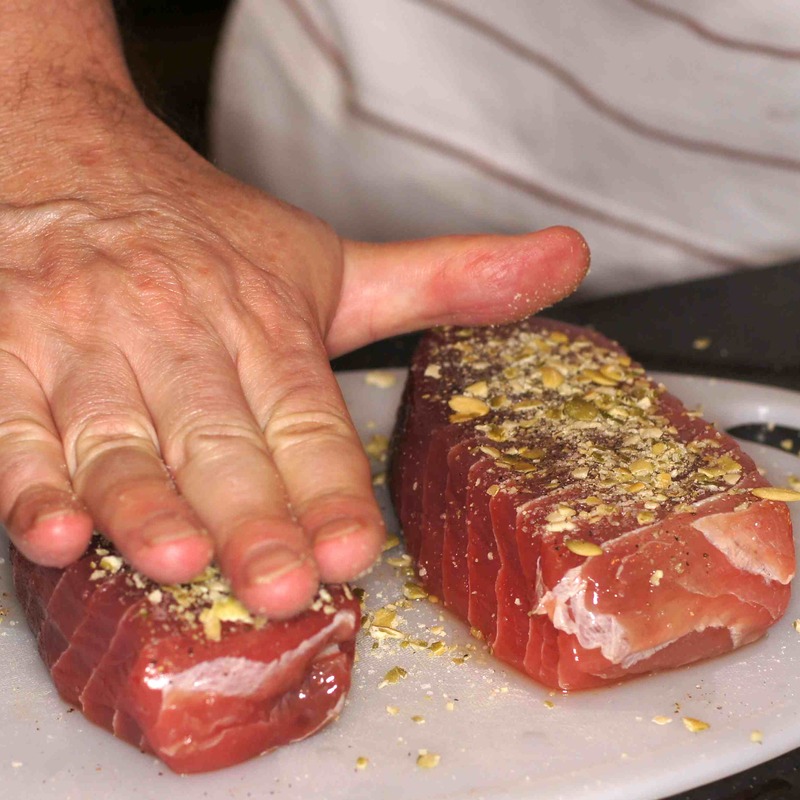 This would give me some additional depth of flavor and a nice textural crunch to the tuna. 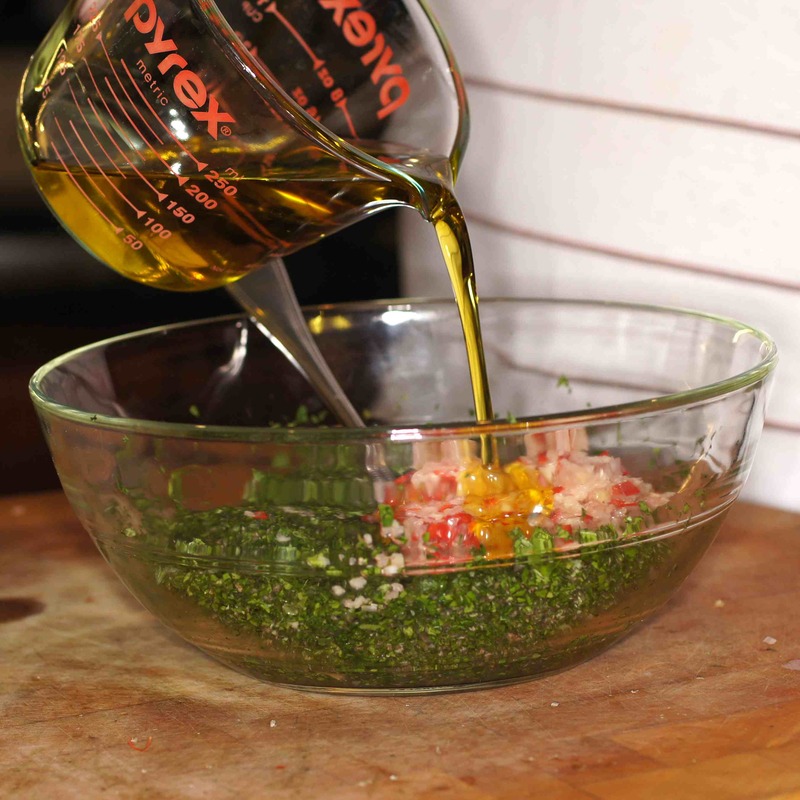 Acid from the chimichurri, fats from the tuna and olive oil, herbaceous spiciness from the chimichurri, meatiness from the tuna and the textural crunch from the pepitas. Everything would be in perfect balance and it was. This is what we did. 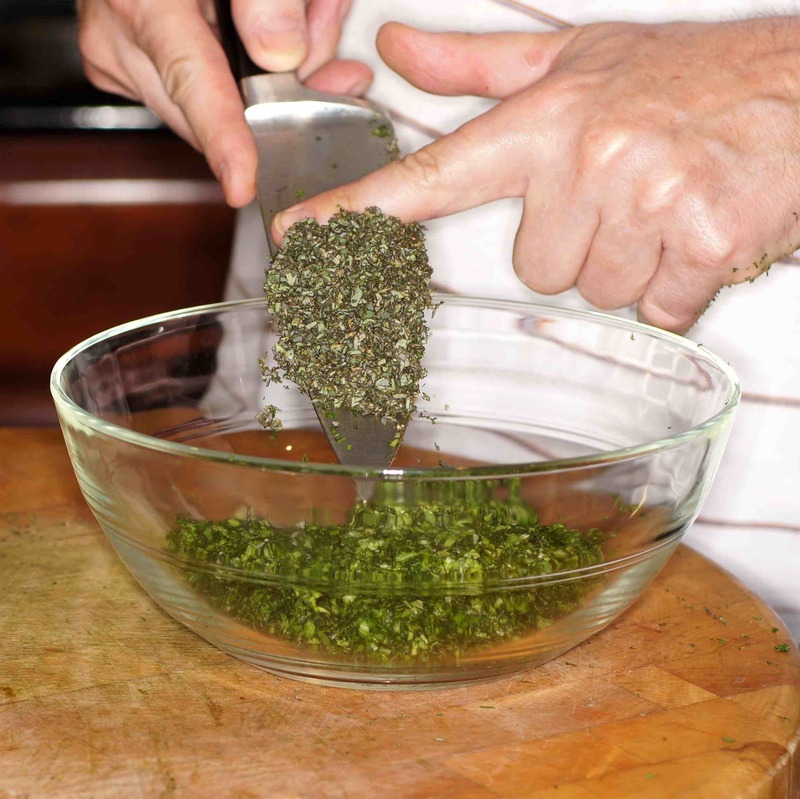 You can do the Chimichurri in a food processor if you desire; however, I find manually mincing the ingredients gives you the perfect texture for the chimichurri. 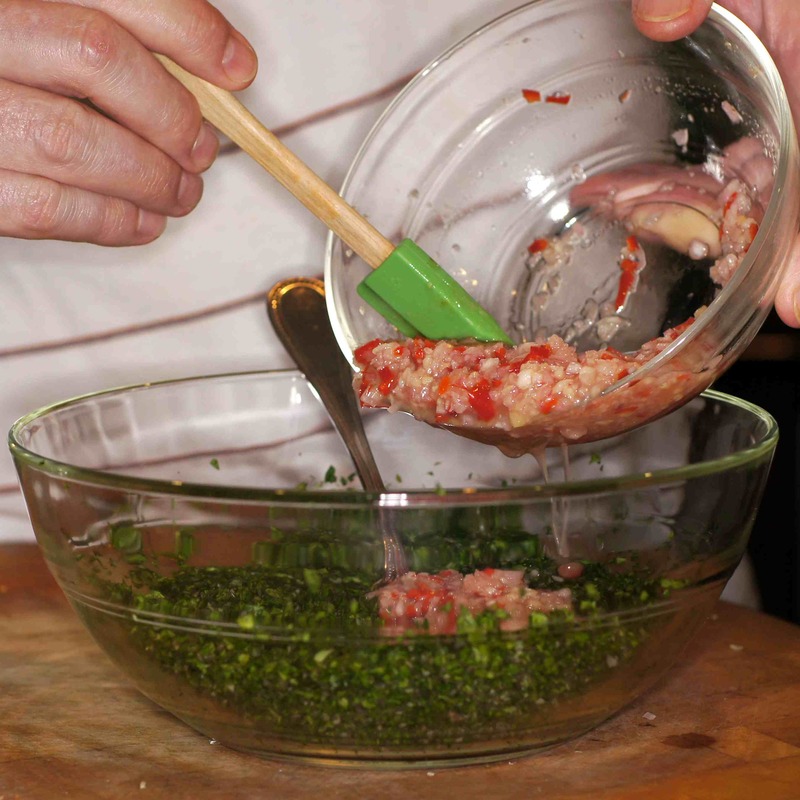 Add the parsley to a mixing bowl. 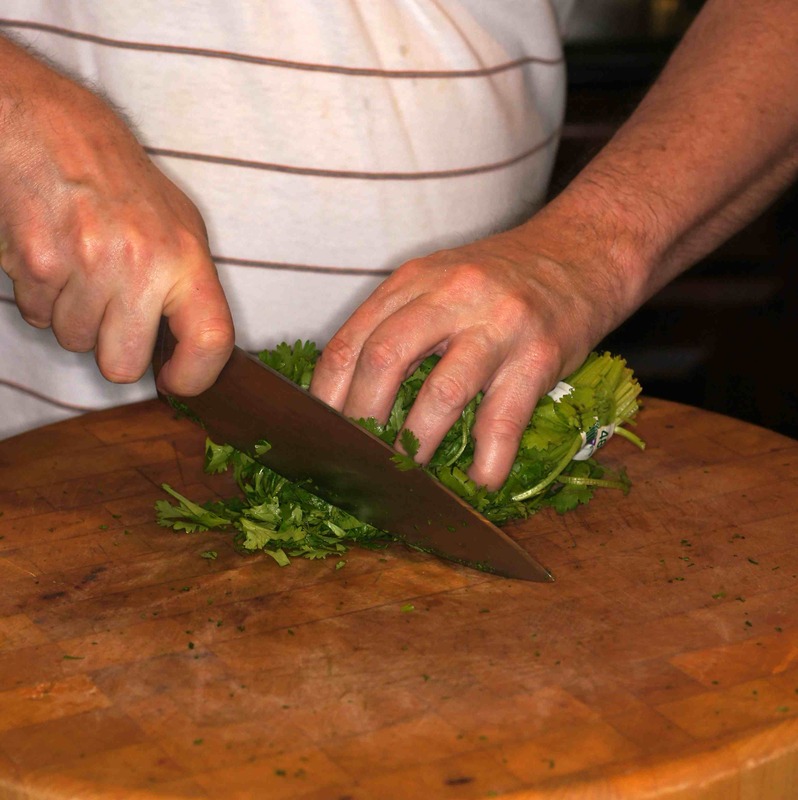 If you prefer, use a food processor and run the parsley, cilantro and oregano in a food processor. Set aside. 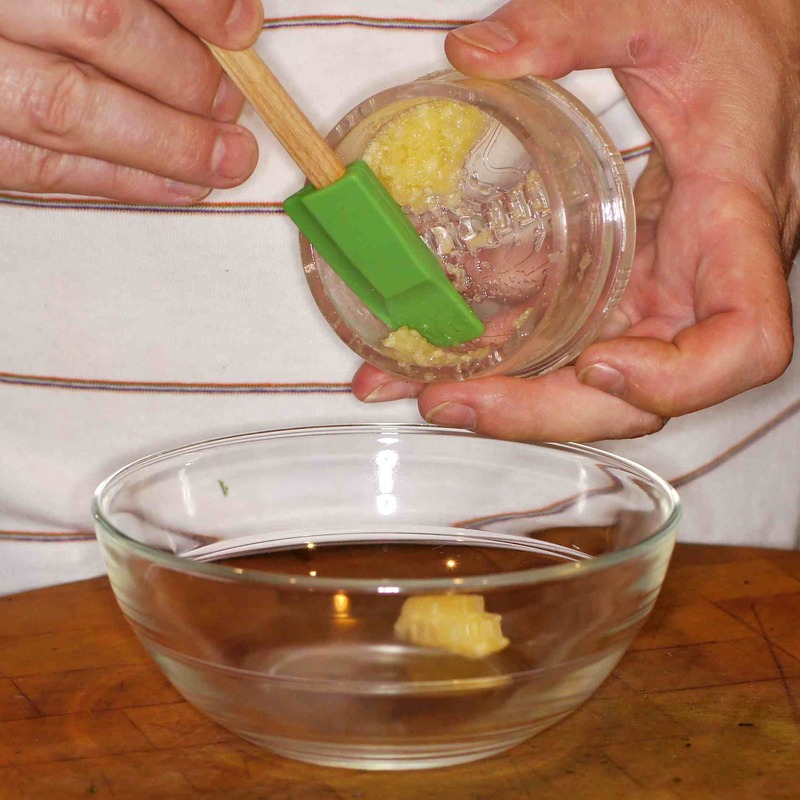 Drizzle olive oil into mixture. 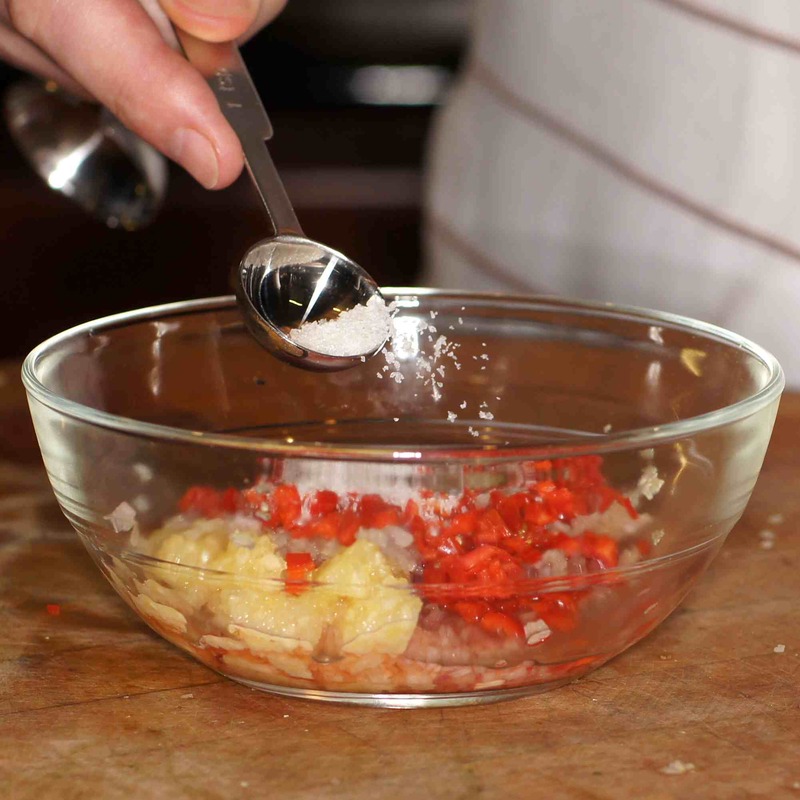 Liberally sprinkle with the crushed pumpkin seeds. Pat down on the fish to adhere the seeds to the fish. 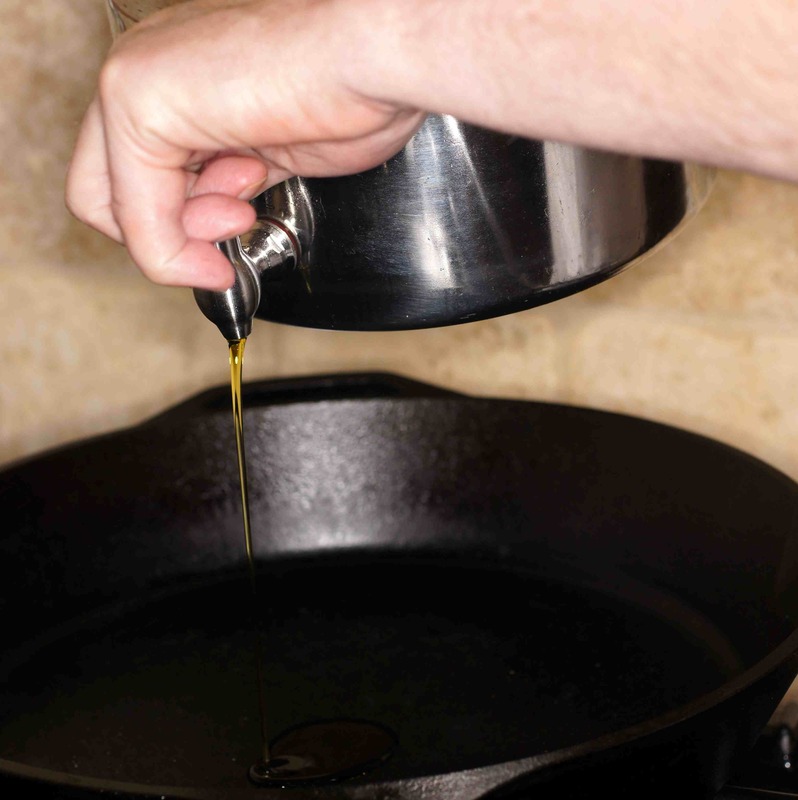 Add oil to a hot cast iron skillet over high heat. What a delightful recipe: even better than the last fish one to which I had no chance to pass a comment! Shall make soonest: what beautiful colours and flavours 🙂 ! Am warmly amused by your usage of ‘Baby Lady’, ’cause have been there myself. My second foodie husband did a lot of restaurant critic stuff in and around Sydemy. One we had met, I suddenly [and, at first unwillingly] became ‘Milady’ [3 Musketeers et al!! ]: shall we say a hypercritical ‘b . . .h’! Totally untrue, but much to my amusement, every maitre d’ and owner around Sydney suddenly ‘bowed and scraped’ . . .don’t think a certain bod saw that coming . . .
Hi, Eha. Thanks for the nice compliment. This was a very enjoyable dish. In fact, this may have been the best balanced seafood dish we have made in a long time. It really all came together and was very lovely. Baby Lady’s simple salad of sliced tomatoes and avocado was a perfect accompaniment, too. Methinks I ‘guessed’ that lovely story ahead of time: and a lucky Lady she is!! As far as the ‘private me’ is concerned: hmm – both husbands called me variations along ‘butterfly’ line . . . yet am not ‘flighty’ in the least 😀 ! Very nice, Richard! 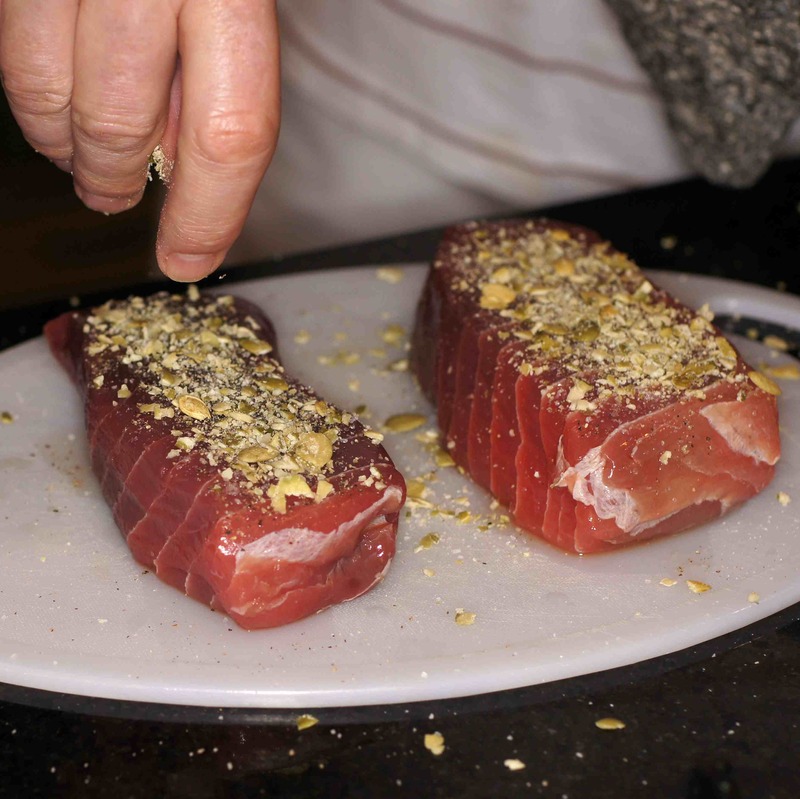 The seared tuna looks great and I really like the idea of the pepitas. I think I’d leave all that chopping to the food processor in triple digit temperatures, but I agree with you the texture is better this way. The sauce reminds me of Italian salsa verde, and makes me wonder if Italian immigrants introduced it to Argentina. Thanks for the compliment, Stefan. 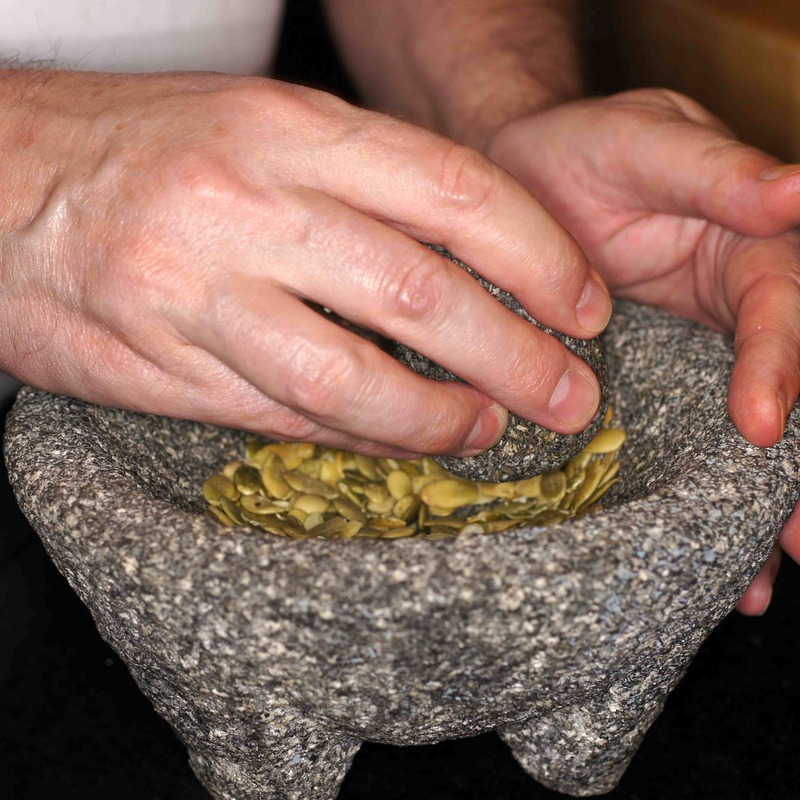 The pepitas added that nice textural element that you are looking for in a meal and they went beautifully with the herbaceous nature of the chimichurri. I was very pleased at how it tied together so well. 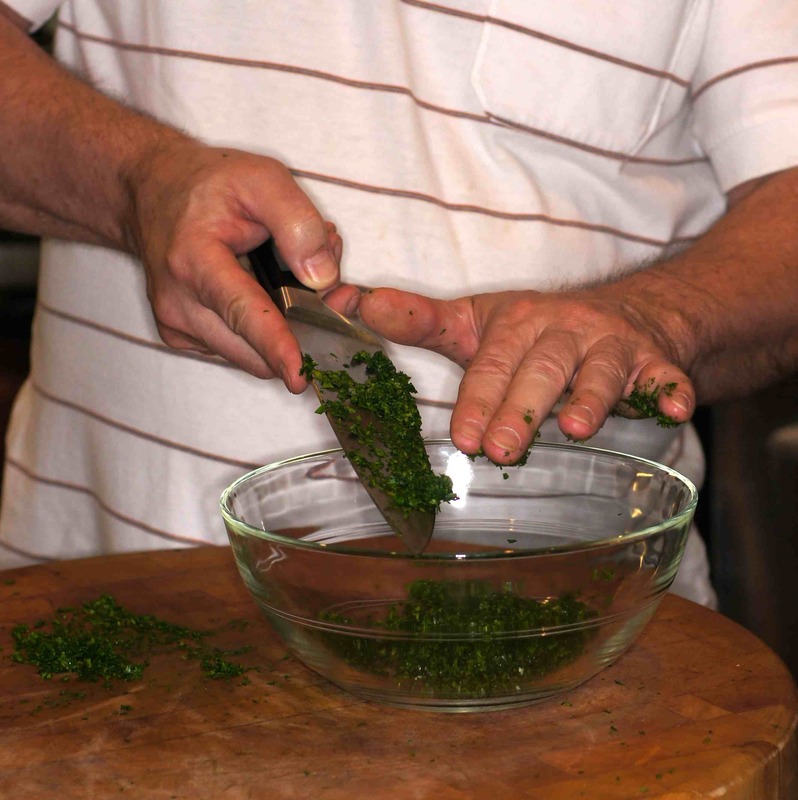 As for the hand mincing of the herbs, AC in Texas is an absolute must. So, while it’s triple digits outside, it’s 76 F inside and hand mincing is not a chore at all. 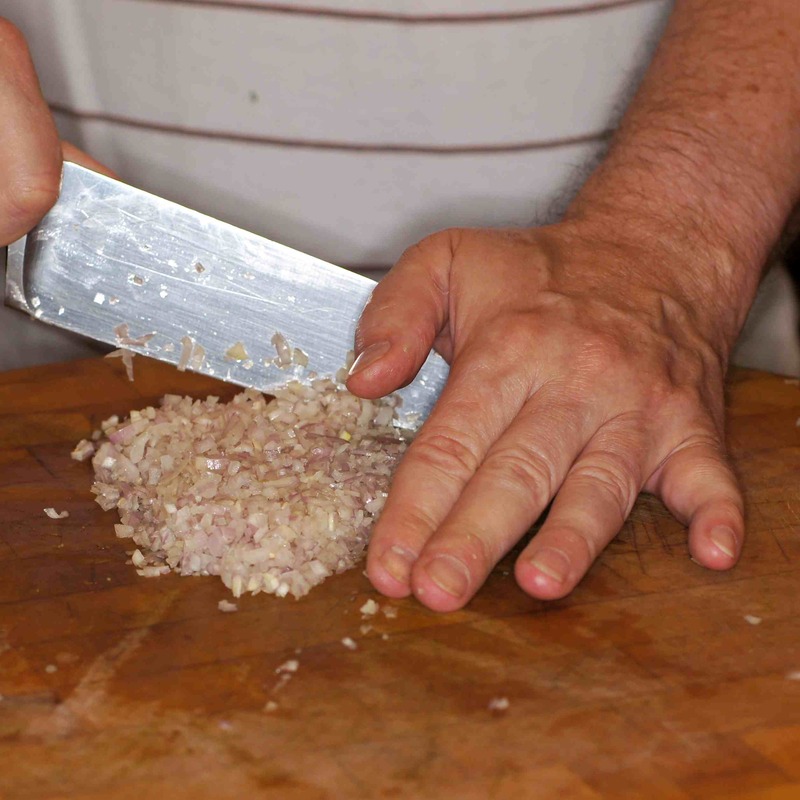 It also gives me the opportunity to keep my knife skills intact. 😉 As for the origins of chimichurri, it has been traced back to the late 1500s and there is a lot of speculation of how it came about. Given it’s similarity to pesto, it would not surprise me at all if it had an Italian origin. Also, there is a large Italian population living in Argentina. Love chimmichurri. Effing love tuna. I want! Thanks. 🙂 It was very tasty, indeed. I totally love the combination you put there. 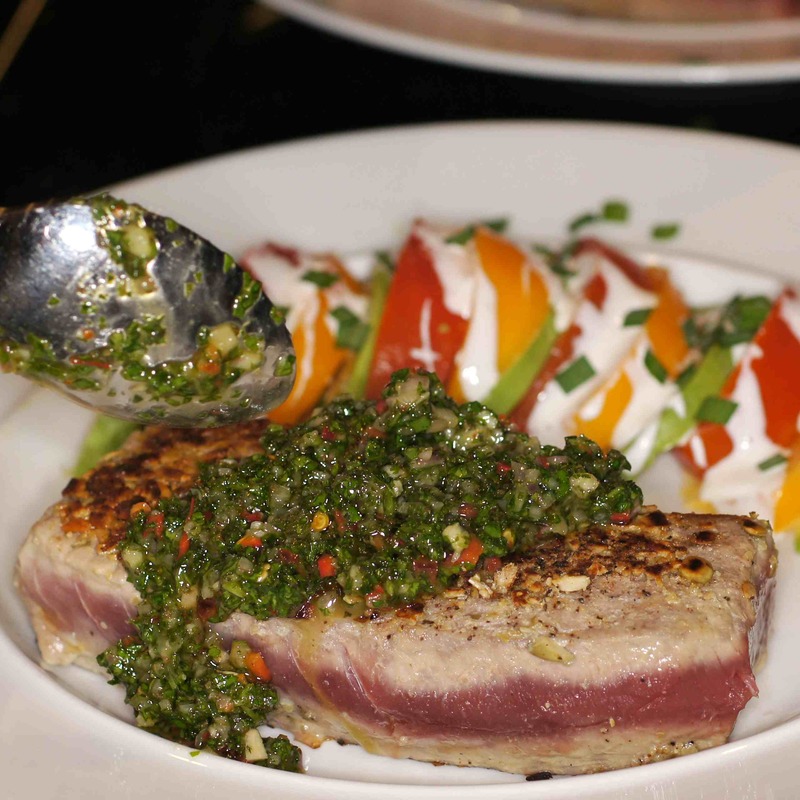 Between ahi tuna and chimichurri sauce, they are totally a delightful combo. I would have been very satisfied with just that perfectly seared tuna and chimichurri sauce, Richard. Encrusting it with pepitas was a great idea. 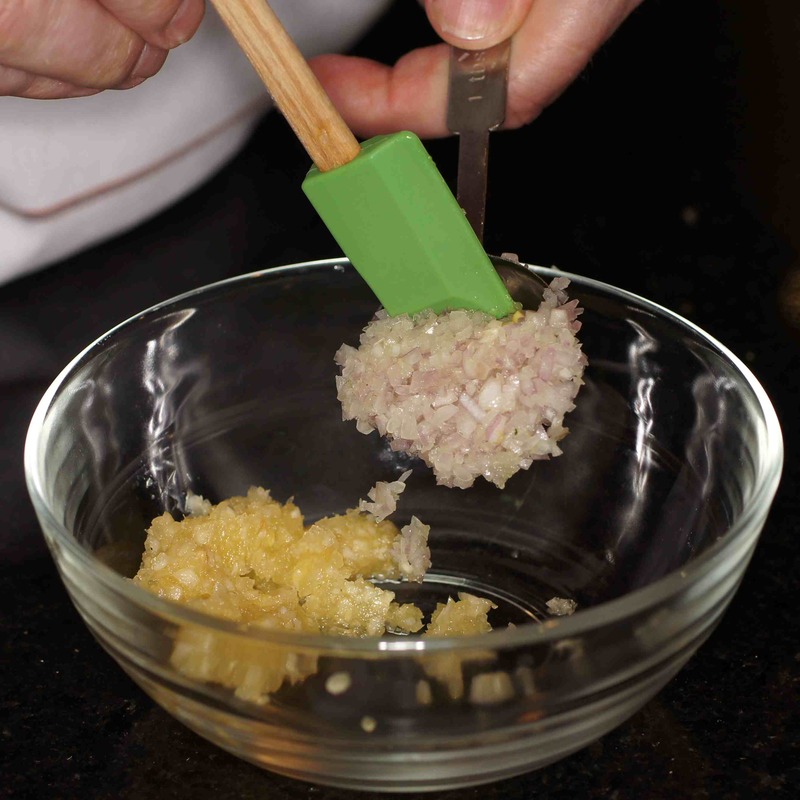 This was another great recipe that you’ve shared with us. That’s the nicest couple of pieces of tuna I have seen in a long time. The crusting is a great idea too. I must try that. Thanks, Conor. The tuna was really fresh and super tasty. The pepitas were a nice touch. All-in-all it was a fun dish. 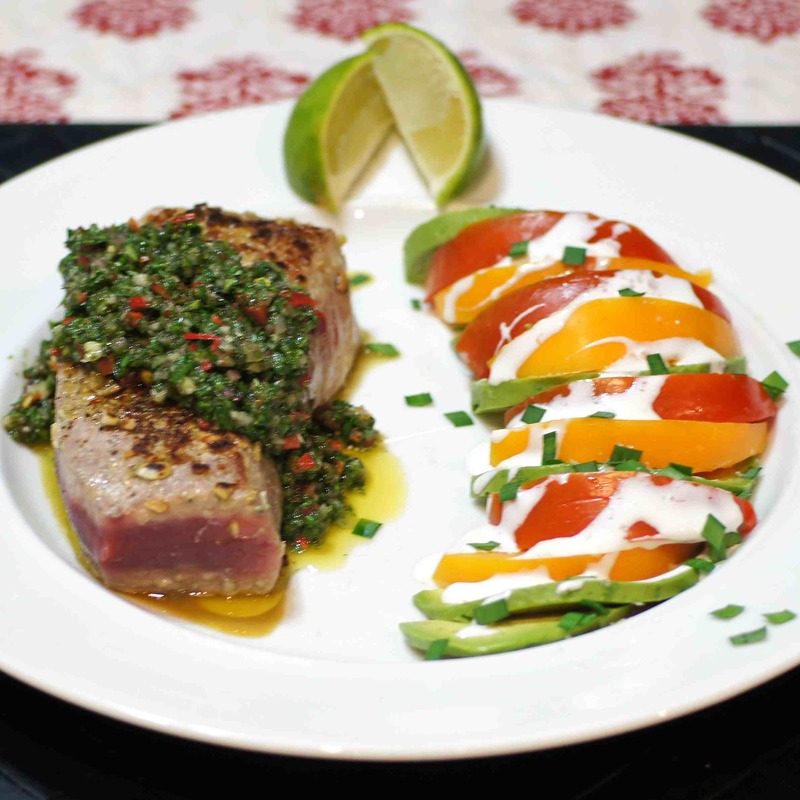 Chimichurri sauce + Tuna : wow it looks so delicious ! Thanks for dropping by and your nice compliment. I assure you the combination is stellar. 🙂 It’s quick and simple. Give it a try.